Php 75 ONE-WAY Base Fare is Extended!!! Philippine Airlines Promo 2016: Great news! Our birthday blowout is EXTENDED until MARCH 23, 2016. Grab our incredibly low fares and experience the full perks of flying with Philippine Airlines! We are treating you to our biggest birthday blowout - the Ultimate 75th Anniversary Seat Sale! 75% Off on Plane Fares! 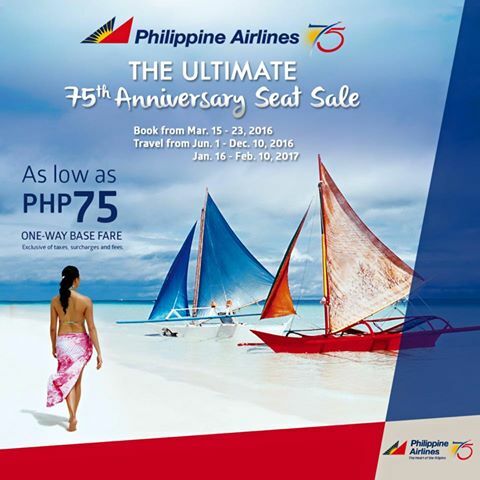 Philippine Airlines Promo 2016: We are celebrating our 75th anniversary with a blowout! Get up to 75% off our fares! Keep on checking our page for more details. Book from March 15 to 19, 2016. Travel from June 01 to December 10, 2016 and January 16 to February 10, 2017.